Anthony’s Caol Fired Wings are the perfect chicken wing to make on the grill. Fired Pizza does it right with these wings and the first time I had them, I knew I wanted to recreate them at home so I could enjoy them whenever I had the craving. They are roasted in an extremely hot pizza oven, so they have little bits of char on them. Delicious! I cannot go to Anthony’s without ordering these wings. The first time I had them, I couldn’t get over how delicious they were and yet so simple. What sets them apart is they are not deep fried or coated in sauce, which makes me feel a little less guilty when I eat them. Roasting in a hot oven instead of deep frying, as with regular wings, is what sold me. They are so full of flavor and the skin is incredibly crispy, making these wings a certain crowd pleaser. I really love chicken wings, and these are without question my absolute favorite. Most of us aren’t fortunate enough to own a pizza oven, so to recreate that smoky char, your oven must be as hot as possible. These wings do require a 24-hour marinade, but the wait is worth it. 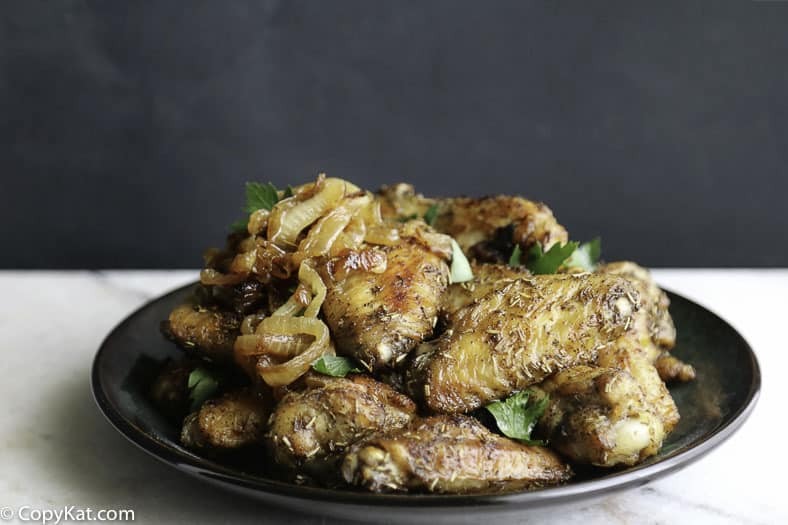 These delicious wings are super crispy and topped with a generous amount of sweet caramelized onions and fresh parsley. Do you love Wings? 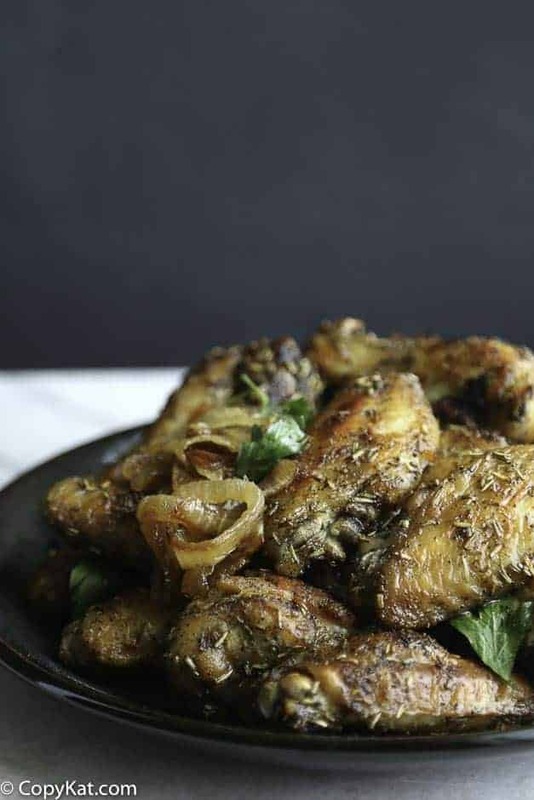 Be sure to check out these favorite Wing Recipes. This recipe was created by Cheryl Bennet of Pooks Pantry. Be sure to check out her recipes there. If you haven't tried Anthony's Coal Fired Wings you are missing out. Make the Marinade: Place chicken wings in a gallon sized zip top bag. Combine all ingredients, except the wings, in a large bowl and whisk to combine. Pour marinade into bag and toss to coat. Refrigerate for 24 hours, turning once to make sure the wings are evenly coated with marinade. Make the Caramelized Onions: In a medium sauté pan, heat oil over medium heat. Add onions, salt and pepper. Cook over medium/medium-low heat for 30 minutes, or until onions are deep golden brown. Set aside to cool Make the Wings: Preheat oven to 500°F. Remove wings from marinade and place in a single layer on a baking sheet. Bake for 12 minutes, flip over and return to oven for an additional 10 minutes. Remove from oven, top with caramelized onions and a sprinkle of chopped parsley. OMG these taste IDENTICAL! Thank you sooo much! Only thing I would suggest as I had no idea since this is my first time but advising to break the joint out. (I’ve never shopped for wings before this). I threw mine on the grill after because I’m a picky one but when husband doesn’t think other things are possible unless you go to a restaurant, thank you because you nailed it !!! CAN I USE THIS RECIPE FOR OTHER CHICKEN PIECES? TEMP? HOW LONG TO BAKE? You could, but you would need to add quite a bit more time, maybe another 30 minutes to the cooking time.